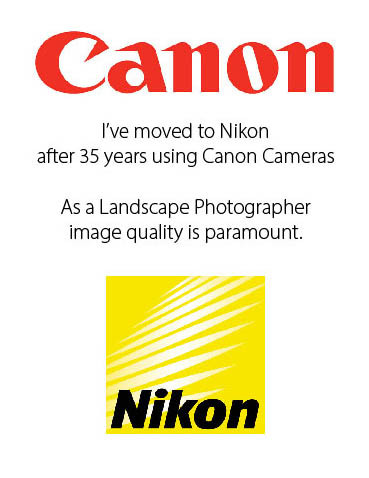 Noel Bennett Photography: Canon to Nikon! It wasn't an easy decision, with a stable of Canon 'L' lenses, but just waiting for the 2015 Canon 5D MkIV wouldn't be enough. Canon seems to be putting more effort into video these days. As a Landscape Photographer image quality is paramount, especially when printing large images for my clients. After exhaustive research it was going to be a close call between the Pentax 645z Medium Format camera and the new Nikon D810. My decision was based on scientific sensor rating tables with Nikon's new D810 taking top marks with a phenomenal score. It even beat the Phase One IQ180 Digital back with a Dynamic Range of 14.8 EVs! As a qualified product designer I also preferred the ergonomic layout of the Nikon. The menu interface will also be easier to get along with. It's down to me now - hopefully my images will see an improvement for the better. I can't wait to see the difference in print.